Although much fuss has been made over Max Mosley's idea of a voluntary budget cap, thereby creating a two-tier formula, this is not the first time that F1 has seen such a creature. In 1966 the FIA introduced the 3 liter formula, replacing the 1.5 liter engines spec that had been in force in the early sixties. To ease the transfer for teams that had no suitable engine, a clause was inserted that allowed supercharged 1.5 engines alongside the big 3 liters. Jean-Pierre Jabouille in the Renault RS01, first to take "the other tier"
At the time, it was an unviable option, the weight and restrictions of supercharging negating any power the tiny engine could put out to compete with the big boys. Unsurprisingly, no one took the option, just as it is highly unlikely that any team will opt for unlimited spending but restricted technical freedom under Max's formula. The option remained forgotten in the rulebook, however, until in 1977 Renault entered a turbocharged 1.5 liter amongst all the 3 liter variants. It was supercharging without the disadvantages and, once Renault had solved its intrinsic heat problems, it became the way to go. For a while there were two types of cars in F1, turbocharged little ones and naturally aspirated big bangers, with the turbos winning inevitably, thanks to their continually increasing power outputs. It is slightly surprising that turbocharging had not been taken into account by the FIA in 1966. It was a technology invented in 1905 by a Swiss engineer, Alfred Buchi, and turbos had been used in aviation engines since World War I. Commercial diesel engines utilized the technology from the 1930s onwards and the first production turbocharged cars were produced by General Motors in 1962 in the shape of its Oldsmobile Cutlass Jetfire and Chevrolet Corvair Monza Spyder models. Even motor racing in the States was aware of the possibilities of turbos, Fred Agabashian having entered a turbocharged car for the Indy 500 in 1952. In that fated year of 1966, Offenhauser introduced turbocharging on its engines and it was only a matter of two years before it began to win races. Obviously, Europe was not paying attention, for the option of supercharging remained unused until Renault put two and two together in the mid-seventies. At first, they experienced difficulties with finding materials that could withstand the heat generated by the turbo and this may well be why it had previously been thought unworkable in F1. By the time the problem was solved, others were no longer laughing (the Renault F1 car was jokingly called the tea kettle since it brewed up so frequently) and were hard at work on their own turbos. 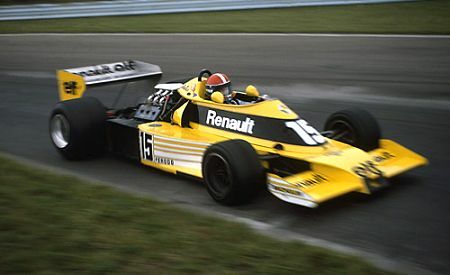 Although they won races, Renault never managed to achieve a championship with their brilliant idea and it was left to others to receive that reward. Returning to the point, Max's suggestion is therefore not the first two-tier formula in the sport and it may well go the same way, all teams going for the budget cap while the restricted free spend option languishes uncared-for and forgotten. There is even a chance that history might repeat itself and, in a decade from now, some bright spark notice the alternative and spend loads of money on introducing a new way of utilizing the rules to gain an advantage. "Those who do not know history are doomed to repeat it..."
up in a similar way to those of tomorrow can be reused. old knowledge faster than their competitors can reinvent it. True indeed, Peter. Nothing is wasted! Unfortunately, by leaving an alternate route to the "voluntary" budget cap, money will be wasted by teams experimenting within the parameters of unlimited spending. The big teams who run cars at Le Mans or engines in the IRL or other series as well as F1, will have access to a great deal of R&D that will not fall under the jurisdiction of F1 team research. Even Mosley must realize he can't curtail development in all the various directions a multi national manufacturer may delve into. Mosley's not created a two tier system. He has once again played with words to hide the fact that he is attempting to dictate terms. But where would they spend the money, Nick? The rules are so restrictive these days that there is virtually nowhere left for a decent engineer to get his teeth into. That's why I like the idea of a budget cap linked to greater technical freedom - it opens the door to clever ideas again. As to policing the thing, I have always said that it's impossible. But it will limit spending to some degree, with teams having to be very careful to hide any extra spending they do. Uncle Max will be watching, after all! good article and nice pic Clive. just before the turbos were being banned the FIA even created a separate champion ship for the normally aspirated engines,the Jim Clark cup,won by Jonathan Palmer in a Tyrrel...ooh the glory of it all!